On large earth moving machines, undercarriage wear is the largest ongoing expense. 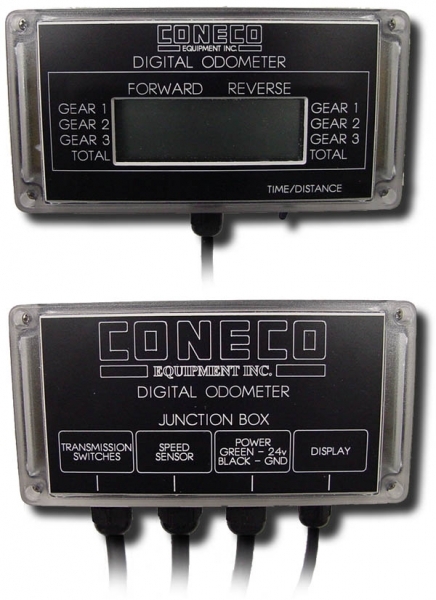 Coneco Equipment Ltd. needed an odometer that separately record mileage and time in all gears in both forward and reverse directions. The most challenging aspect of this project was optimizing the technique used to write to the EEPROM memory chip. EEPROMs are the ideal storage media for this application but they have a limited number of write cycles. Even though these devices are getting better, care must be taken to preserve data as the number of write cycles increase. The software uses several error checking algorithms to verify each data block and swaps in a spare block if an error occurs. This product was custom designed for Coneco Equipment Ltd.